Below you will find our featured plastic popcorn bowls in three different sizes - for what ever your need is. We have small, medium, and large plastic popcorn bowls. Some people refer to our plastic popcorn bowls as plastic popcorn scoop boxes as well. What a great way to serve popcorn at a party, home theater, convention, car dealership, entertaining event, or carnival. Endless ideas for the use of these novelty popcorn containers. For birthdays, Holidays, business conventons you can fill the medium and large bowls with different gift type items.and party favorites or use as center pieces. Free shipping on most of our popcorn bowls. And back in stock, we now have enamelware metal popcorn bowls. Mini Plastic Popcorn Bowl. Our new plastic fun popcorn container evokes the fun of the movies. Red and white vintage stripes make a fun addition to any movie night. This popcorn box is small, making it ideal for individual portions of popcorn. Great Children's Popcorn Bowl. Economically priced. 3 3/4" at the top and 3 1/4" across the bottom. Buttery Popcorn Bowls. This popcorn bowl is made of a very durable melamine material. Great for popcorn with buttery topping or without. Dishwasher safe, and easy to clean. This popcorn bowl is made in the shape of popcorn kernel giving it a fun and unique shape and look. Children will have lots of fun eating popcorn out of this popcorn bowl! Great for serving chips and other snacks. Grab some for this Summer when the kids are home from school! Bowl dimensions: 5" in diameter and 2 1/2" tall. Small Red Striped Top Popcorn Bowl. Small red striped top Popcorn Bowl. Great for individual serving....especially suitable for children. Each small individual bucket holds approximately 2 cups of popcorn and measures 5" across the top and is 4.5" tall. Made of Strong durable plastic. so they can they can be used again. Each bucket also features a removable kernel separator that drops the unpopped kernels into the bottom of the bucket where they don't interfere with your popcorn enjoyment! Close Out Sale. Small Red and White Plastic Popcorn Bucket. Perfect sized popcorn bowl for children. Also great to use for smaller portions of popcorn for adults. Inside filter to sort out popcorn seeds from the popped popcorn. Makes popcorn eating more pleasureable and fun! Dishwasher safe. Measures 4.5 inches tall, 5.25 inches wide at opening. Red and White Striped with Popcorn Logo Set of 4 Plastic Popcorn Cups. Great item for gift giving by themselves or can be filled with goodies like candy, popcorn balls, and more. Will be a great hit at all your Holiday and Christmas parties too! Set features durable plastic containers with a fun popcorn print with red and white stripes for a movie theater experience at home. Each cup measures approximately 7" tall and 4.5" in diameter. Fun Time Popcorn Bowl. Add some style and pizzaz to your popcorn eating. Large popcorn bowl that will hold up to 6 quarts of popcorn. "Popcorn" is printed on the outside of the bowl on two sides and the inside is a decorative yellow color. Great party bowl or family movie night bowl. Made of strong sturdy plastic. Great bowl also for popcorn gift packs. 7.5 Inch plastic red and white popcorn scoop container. This plastic popcorn scoop bowl is nostalgic design like years gone by. This plastic popcorn box resembles the cardboard popcorn containers of year's past, only these are made of durble plastic to be reused over and over Great for movie night or social parties. Use it for popcorn or caramel corn. Holds 3/4 oz of an ounce of unpopped popcorn. If you are looking for our disposable paper popcorn scoop boxes, go to popcorn supplies. An old favorite has returned back...Enamelware popcorn bowl. Old fashioned looking red enamel popcorn bowl can be used for various functions including movie nights, gift items, and more. The perfect bowl when eating Popcorn! 10" Enamelwear bowl is easy to clean and is large enough to fill for the whole family. 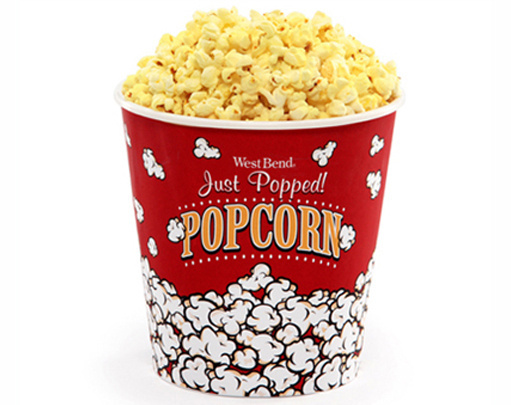 Don't forget to check out our popcorn supplies by clicking here. 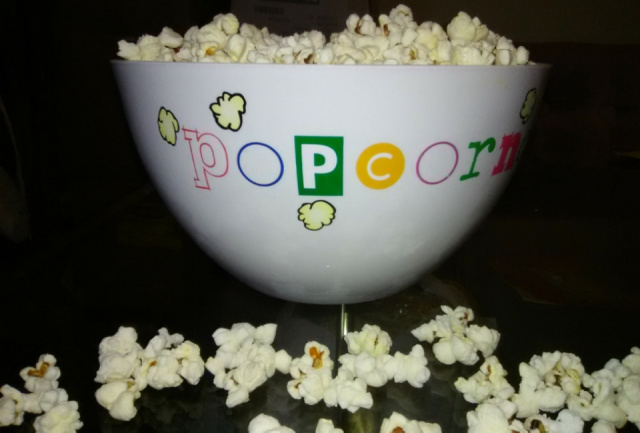 Retro Medium weight Jumbo Plastic Popcorn Bowl. Red and white stripes with the word popcorn featured on this nostalgic designed popcorn bowl. Great for gift baskets, convention item, or for home parties. Has a classic movie theatre look. Stands 8" high and 7.5 " x 7.5" wide at the top and 5" x 5" wide at the bottom. At Standard Concession Supply, we now feature a family size large plastic popcorn bucket. Colors of the bowl are Red and White, plus our new colors of Lime green or Blue with white background. Popcorn Bowl has a bottom insert that filters out un-popped popcorn kernels! Bring that theater feeling right into your own home. Dimensions are 8.25 inches tall by 9.25 inches wide at opening. Dishwasher safe. Large Round Plastic Popcorn Bowls On Sale - Lime Green and Royal Blue. Popcorn Bowl colors feature Lime green or Blue with white background. Popcorn Bowl has a bottom insert that filters out un-popped popcorn kernels! Bring that theater feeling right into your own home. New at Standard Concession Supply...Squat plastic popcorn bowl. Great popcorn bowl for parties and movie nights. Popcorn bowl is 9 3/4 inches in diameter. Medium Size Plastic Popcorn Bowl. An old favorite is back, this red and white striped plastic bowl is constructed of durable plastic. Great plastic popcorn box for movie nights, gift boxes, or for a decorative setting. 8 inches tall and 4 by 4 square at the top. Hand wash only, not for use in microwave. For the real hungry popcorn eater! 2 Large red and white plastic popcorn bowls holds 8.5 ounces of popped popcorn each.. Great for movie night or late night parties. Keep the munchies coming. This large plastic popcorn container is 10 inches tall by 8 inches square. Popcorn bowl is dishwasher safe. Can be used for popcorn or caramel corn. Super item when used as a container for hand made gifts or gift baskets. Also great for party favorites. New 1.25 Qt Popcorn Bowl. Colorful popcorn container will liven up any party. Grab several bowls to have one for each member in your family. Decorated with a fun popcorn theme. This small Victorio popcorn bucket is perfect for repeated use at home for a movie theater feel any time. Stain-resistant plastic is durable for repeated use. Colorful and attractive 3 Qt Movie Time Plastic Popcorn Bucket. Experience enjoying popcorn just like if you were at the movie theater. Make family movie time fun with this theater-style popcorn bucket! This Victorio popcorn bucket is made from a durable plastic material, and can be used for repeated use and is dishwasher safe. Bright Yellow/Orange very attractive Movie Theater Design Popcorn Bowl. Bring the movie theater atmosphere home with this Large Popcorn Bucket featuring a durable bucket with a fun popcorn print and the word "Popcorn" on both sides. Three Qt. popcorn bowl will hold sufficient popcorn for 1 to 2 people. 7" tall x 6.5" diameter at top of bucket. Great for all your movie get together. Jumbo 7 Quart Plastic Popcorn Bowl. Super size your popcorn bowl needs. Decorated with a fun and colorful popcorn theme. Popcorn bucket is perfect for serving the whole family popcorn for movie night. Great for creating gifts and door prizes from. Dishwasher safe and stain resistant. Plastic is durable enough for repeated use. Dimensions: 8.5" tall x 9.50" diameter at top of bucket.